Tom Doig is the author of travel book Moron to Moron: Two men, two bikes, one Mongolian misadventure (Allen & Unwin, 2013) and The Coal Face ( Penguin, 2015), which reports on the human cost of the disastrous 2014 Hazelwood coal mine fire. The Coal Face is the joint winner of the Oral History Victoria Education Innovation Award 2015, and has been described as “a very moving book” by Christiana Figueres, the Executive Secretary of the United Nations Framework Convention on Climate Change. Tom’s nonfiction has been published in The Big Issue, Crikey, New Matilda, Smith Journal, The Lifted Brow and Voiceworks. 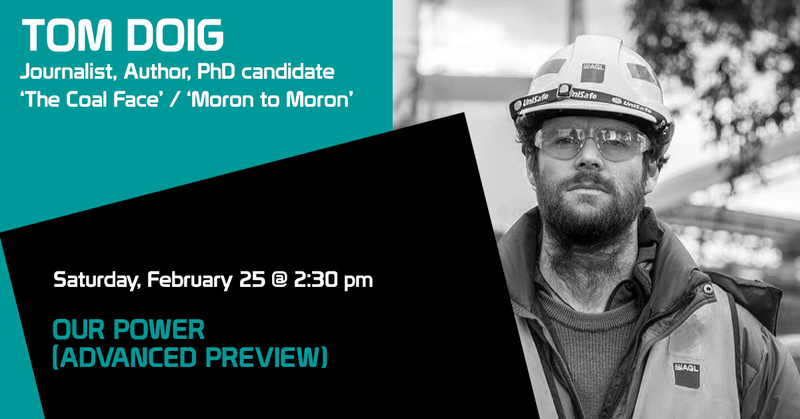 He is currently a PhD candidate at Monash University, researching the lived experience of crisis and climate change in the Latrobe Valley, and writing an expanded version of The Coal Face. In a previous existence, Tom was involved in making a wide range of wacky and dubious videos, including Tom as the young David Hasselhoff, Tom’s mate Thomas pestering Brett and Jemaine from Flight of the Conchords in the late 90s, Tom and Laura and a foam dolphin on a Trans-Tasman cargo ship escapade, and Tom attempting to eat jellied meat in a can in northern Mongolia. THE COAL FACE, a short book about the 2014 Hazelwood Mine fire – published by Penguin Books Australia, out now.